Love, Daddy: Happy Anniversary To Us! My husband and I were married by Reverend Scott Ramsey, my childhood friend and partner of Tex in the City, three years ago today. 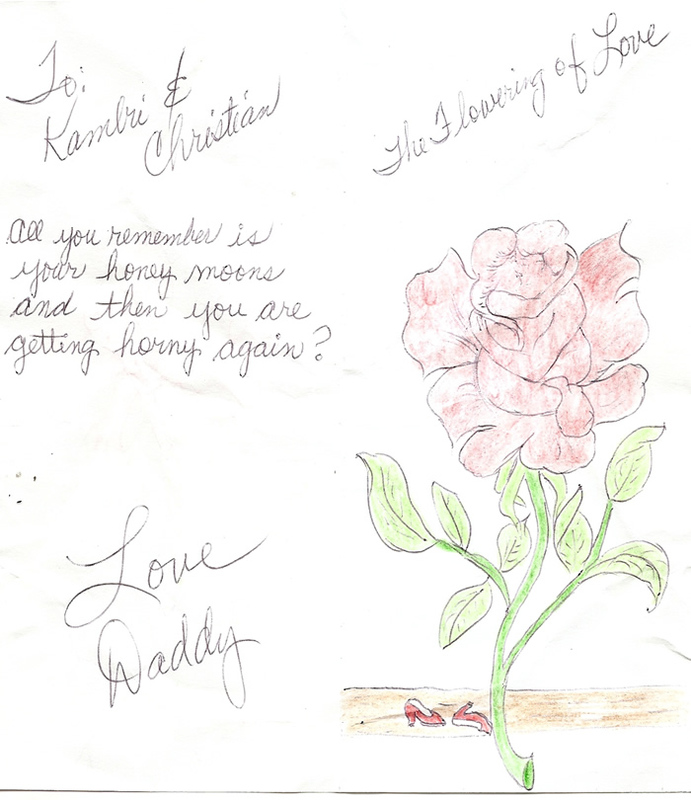 Dad remembered the special day and sent this hand drawn card. A little risque...again! Haha! But that rose is pretty cool. Click on the image to see the inside. That is FUNNY. Sense of Humor.. good drawing overall. It keep you thinking what he think. LOL.. There's one for Hallmark! WOW! Wow, Christian lost all of his hair except for one long loopy strand and had surgery performed on the tip of his member so it resembles Japan's Mount Fuji? Gosh, Woman! What in Hades did you do to him?